MARCH 2018 I DESIGN007 MAGAZINE 31 We also have plug-ins. 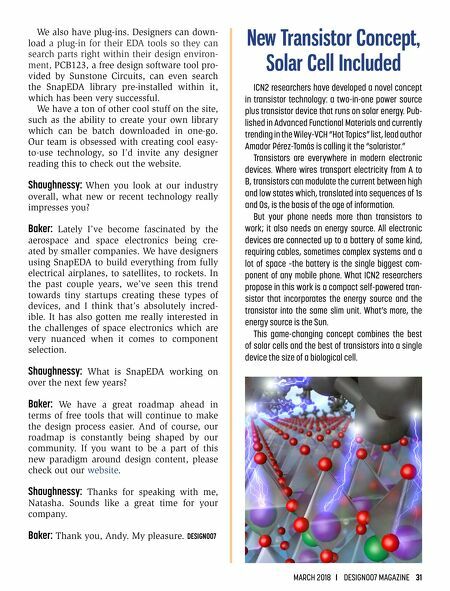 Designers can down- load a plug-in for their EDA tools so they can search parts right within their design environ- ment, PCB123, a free design software tool pro- vided by Sunstone Circuits, can even search the SnapEDA library pre-installed within it, which has been very successful. We have a ton of other cool stuff on the site, such as the ability to create your own library which can be batch downloaded in one-go. Our team is obsessed with creating cool easy- to-use technology, so I'd invite any designer reading this to check out the website. Shaughnessy: When you look at our industry overall, what new or recent technology really impresses you? Baker: Lately I've become fascinated by the aerospace and space electronics being cre- ated by smaller companies. We have designers using SnapEDA to build everything from fully electrical airplanes, to satellites, to rockets. In the past couple years, we've seen this trend towards tiny startups creating these types of devices, and I think that's absolutely incred- ible. It has also gotten me really interested in the challenges of space electronics which are very nuanced when it comes to component selection. 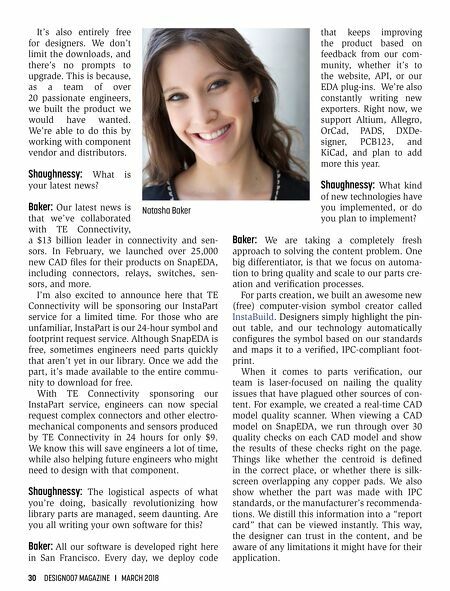 Shaughnessy: What is SnapEDA working on over the next few years? Baker: We have a great roadmap ahead in terms of free tools that will continue to make the design process easier. And of course, our roadmap is constantly being shaped our com- munity. If you want to be a part of this new paradigm around design content, please check out our website. Shaughnessy: Thanks for speaking with me, Natasha. Sounds like a great time for your company. Baker: Thank you, Andy. My pleasure. DESIGN007 New Transistor Concept, Solar Cell Included ICN2 researchers have developed a novel concept in transistor technology: a two-in-one power source plus transistor device that runs on solar energy. Pub- lished in Advanced Functional Materials and currently trending in the Wiley-VCH "Hot Topics" list, lead author Amador Pérez-Tomás is calling it the "solaristor." Transistors are everywhere in modern electronic devices. Where wires transport electricity from A to B, transistors can modulate the current between high and low states which, translated into sequences of 1s and 0s, is the basis of the age of information. But your phone needs more than transistors to work; it also needs an energy source. All electronic devices are connected up to a battery of some kind, requiring cables, sometimes complex systems and a lot of space –the battery is the single biggest com- ponent of any mobile phone. What ICN2 researchers propose in this work is a compact self-powered tran- sistor that incorporates the energy source and the transistor into the same slim unit. What's more, the energy source is the Sun. This game-changing concept combines the best of solar cells and the best of transistors into a single device the size of a biological cell.